Explain about import registration process, cargo movement to Mexico from overseas countries, Import delivery process in Mexico etc. How to import to Mexico? What are the import procedures in Mexico to move goods? Detail the import methodology in Mexico. 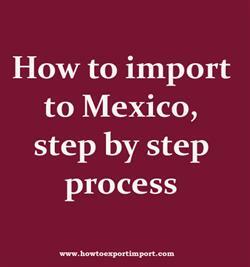 This post explains about step by step procedures that need to be finished with Mexico government authority for importation to Mexico. All importers and exporters need to be register with the Federal Register of Taxpayers. Then only they can engage in import export business which they want. For the purpose of import, the buyer should also be enlisted on the 'Padrón de Importadores' (Importer Registry) maintained by the Ministry of Finance and Public Credit. Tax Administration Service, Servicio de Administracion Tributaria (SAT), is the revenue service of the Mexican federal government under the Mexican Secretariat of Finance and Public Credit which is the finance ministry of Mexico. The document called 'pedimento' need to filled and submitted in customs by importers or exporters during the importation or exportation of their goods. In many cases, the documentation may also vary depending on the country of origin or destination. The documents may have to be prepared in a special way to comply with the requirements of the import or export country. Any delay in filing or absence of documents can delay the clearance process and thereby importer supposed incur demurrage on the imported cargo but also stand to loose business opportunities. This post explains about different phases in import process that every importer needs to go through in Mexico. Guidelines to import to ALTAMIRA. Please guide to import to Puebla. Help to import to. Procedures required to import to Puerto Vallarta. Requirements to import to onterrey. Clarifications to import to Oaxaca. How can I import to Morelia. What should I do to import to TAMPICO. How to import to VERA CRUZ? Formalities for import to TAMPICO. Procedures to import to SALINA CRUZ. Need to import to Tijuana. Explain to import to TAMPICO. Information to import to Tampico. Step by step process to import to VERA CRUZ. Methods to import to Querétaro. How to Import to Swaziland? How to import to India from Swaziland?